Dear Distinguished Guests and, Colleagues! Climate change has far-reaching effects on human and ecological systems, requiring collaboration across sectors and disciplines to determine effective responses. Our population is rising at a staggering rate and demands ever more resources, while the changing climate is making matters worse. Rising temperatures, polluted air and extreme weather, among the most impactful results of climate change, threaten both physical and psychological well-being. Children, seniors and people with lung or heart disease are especially at risk. It was recognized that 2015 was the warmest year on record, reaching 1°C above the pre-industrial average. The continued increase in CO2 emission and the resulting warming of the Earth are impacting extreme events, e.g., water resources, coastal erosion, ecosystems, biodiversity, food and fibre production, human health, etc. In response, 195 nations as part of the United Nations Framework Convention on Climate Change adopted the Paris Agreement, which aims to limit the global temperature increase below 2°C above pre-industrial levels. On another level, for most decision makers there is little guidance on how to best address the linkages between air quality and climate change within the policy process to understand how the emissions of air pollutants and greenhouse gases will impact climate, human health, ecosystems, agriculture, etc. Since 2010, ICEEE has taken around the world with hosting large number of participants from different countries and after a great successful of the last six ICEEE International Conferences which brought together the world’s professions and practitioners from different fields of environmental sciences and engineering. After a great successful of the last five ICEEE International Conferences which brought together the world’s professions and practitioners from different fields of environmental applied sciences and environmental engineering, the Óbuda University, Rejtő Sándor Faculty of Light Industry and Environmental Protection Engineering, Institute of Environmental Protection Engineering and the International Council of Environmental Engineering Education (ICEEE) have the great pleasure to organize and invite you to participate in the 6th ICEEE-2015 International Conference deals with „Global Environmental Change and Environmental Health: Progress and Challenges” during November 19th - November 21st 2015 in Budapest. 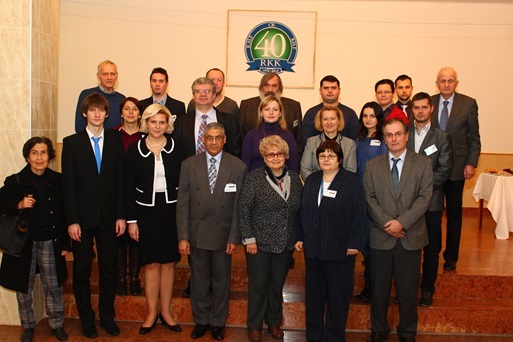 On behalf of the Presidium of the International Council of Environmental Engineering Education (ICEEE), it’s our pleasure to invite you to participate in the sixth ICEEE-2015 International Conference on „Global Environmental Changes and Environmental Health: Progress and Challenges” in November 19-21, 2015 organized by the ICEEE at Óbuda University, Budapest (Hungary). This Conference is a part of the International Joint Conference on Environmental and Light Industry Technologies (IJCELIT2015). We are looking forward to see you at the Conference and we hope that you will find it a stimulating scientific event and a happy personal experience. The full content of the CD, the Proceedings can be can be downloaded in PDF format (14.8 MB). On behalf of the International Council of Environmental Engineering Education (ICEEE) Presidency and the Organization Committee, it is our great pleasure to welcome you in the 5th ICEEE International Scientific Conference on „Global Environmental Change and Population Health: Progress and Challenges” (November 19-21, 2014) at Óbuda University Rejtő Sándor Faculty of Light Industry and Environmental Protection Engineering (RKK) in Budapest, Hungary. The collaboration among scientists from various World universities and institutions will contribute to our professional development, uniting our efforts in developing joint scientific projects and contracts. We hope the conference will yield positive results for all participants. The official language of the Conference is English. The programme will cover all major branches of environmental topics of soil, water, air, etc. and will include invited plenary lectures, lectures and posters sessions. Wish you successful fruitful discussions, and pleasant stay in our beautiful city Budapest on the bank of the Blue Danube River. Here you can find your article in the Proceedings Part A.
mechanisms to protect future generations. - To bring together all academics, students, and researchers in the fields of fundamental and applied sciences of environment, environmental engineering and environmental technology to a universal discussion and find opportunities for a better future for our generations. - To provide a forum for the discussion of most recent scientific results on the interactions of the environmental changes and human health. - To promote research activities and exchange information between researchers. - To provide an interactive forum for exchange of ideas by bringing together and promoting durable and strict relationships among established and young environmental scientists and researchers who operate in the field of environmental sciences. The official language of the Conference is English. • ICEEE is the International Council of Environmental Engineering Education which is defined as the international non-profit independent organization of non-governmental (civil) cooperation for environmental engineering education and scientific research for the future, joint efforts of the world youth activities. • The ICEEE exists solely to provide programs and services that are of self-benefit. These include effective management and monitoring the performance of various fields of Environmental Engineering Education (EEE) as well as the technological development of EEE. • The main aim of ICEEE is to improve the education of environmental engineers living in different European countries as well as all over the World to explore opportunities for operational contact for the nations, in order to encourage the emergence of cooperation, with the appropriate forum. • Such cooperation is identified as an important issue to assess the problems of basic and higher education and scientific research in the field of environment and humanity, discuss and submit recommendations on the basis of the conclusions extracted from the scientific meetings. → The ICEEE was public officially in April 2010 as the Council for the Promotion of EEE. environmental engineering and environmental technology education. graduate higher degree (M.Sc.) and Ph.D. development. 3. Facilitate productive cooperation among life industry, academy and government. 5. Promote the value of the engineering profession. The ICEEE is committed to furthering education in environmental engineering and engineering technology. This mission is accomplished by promoting excellence in instruction, research, public service, and practice; exercising worldwide leadership; fostering the council of environmental engineering technological education; and providing qualified and educated graduated students. and scientific research, environmental issues in the countries of member’s universities. • To recognize outstanding contributions in the field of environmental engineering education with a particular focus specified by the ICEEE, the awarding of recognition for outstanding international cooperation between the universities has the potential to improve the quality and strengthen the educational processes. support to the development of the ICEEE. as professionals in a global environment. free or through separated additional agreements. participants of the conferences directed by the invited university. • The headquarters staff will assist council leaders in their efforts to serve the members. addressed to the General Secretary. • The regulations and the by-laws of the ICEEE will be published in a separate supplement.